With summer coming to an end (thanks to the chill in the air) don’t think the fun’s over. Fall in Toronto brings beautiful scenery and some awesome Canadian shows like Inland. I had the opportunity to attend the previous show in May. It housed over 65 Canadian designers where more than 95% of the collections on display were handmade or manufactured in Canada. What a way to support local talent! I’m invested in purchasing local pieces because I get a chance to meet the designers, understand the purpose of their brand and really connect with it. This makes me a more informed consumer and makes me appreciate the effort it took to create my somewhat unique piece. This Montreal based jewelry brand was major eye candy and I kept going back to the stall because of the unique way Tamara Bavdek incorporated vintage lace with metals. Considered to be statement jewelry, the pieces were lightweight and definitely wearable for every day. More on this ah-mazing jewellery brand on the blog. So many colours and styles to choose from! In terms of handbags, Ricky Shi’s brand screams quality and classic styles as he aims to combine the structural influence of industrial design with his love for fashion. The two prominent designs were the Wonder and the Mingle (such apt names). The Wonder a.k.a a wonder he managed to modernize the classic doctor satchel. I could see myself strutting along in the sunflower Wonder Mini with an all denim outfit. Uppdoo has a stunning forest green Italian Napa leather Wonder available online that I have my eye on for fall! 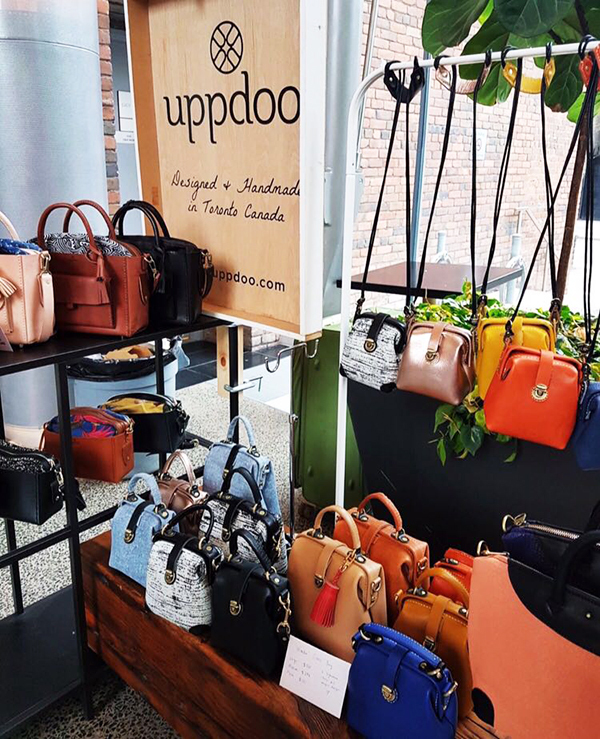 The Mingle – synonymous with a classic cross-body style had the most beautiful Italian vegetable-tanned leather I had ever felt! The Mingle (great for mingling, duh) comes with the choice of five fabric inserts so you can have fun mixing and matching prints. You can tell how meticulously each bag is made AND you can visit the Toronto store to see them being crafted! 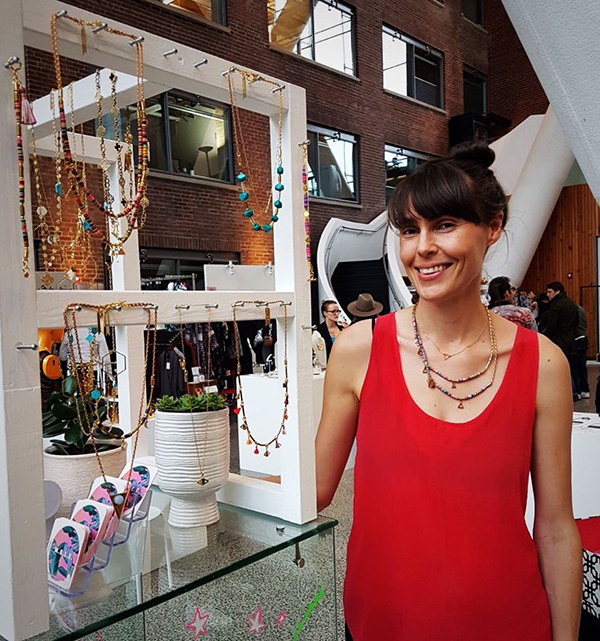 I had the pleasure of meeting the humble Marijke Bouchier who reveals her impish side through her bracelets and necklaces. Her limited edition designs are colourful and incorporate different metals, stones and TASSELS (yasss!). She creates each piece herself using vintage and contemporary materials. Her designs are lightweight and perfect for stacking. I was SO happy to get my hands on one of her bracelets because now it’s sold out! Prior to moving to Canada, I was never one for minimalist jewellery. I thought if you were wearing something it had to be statement worthy. 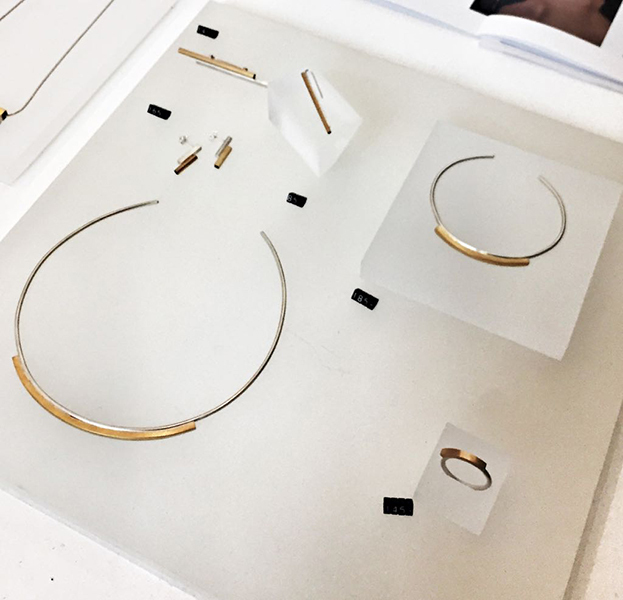 These pieces from Arc though having simple architectural lines and using only metals are very swoon-worthy! Take the Theorem Ring Set for instance – I love that it’s 2 rings in one. You can choose to wear the inner ring, the outer ring or both together. Lina Hu has a lot more double triple rings like this one in her Vacancy and Linearity collections. Will definitely be checking out her booth at the upcoming Inland show. 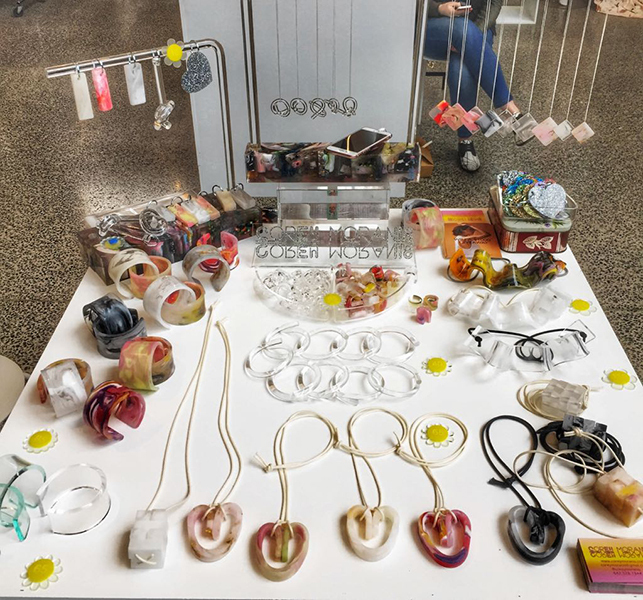 Corey Moranis shared her line of Lucite jewelry which was very playful and loud, in comparison to the sophistication of Arc Jewellery. She feels creative expression and the joy of adolescence shouldn’t be left behind. You can tell from the shapes and designs of her rather large pieces everything is bubbling with energy and colour. 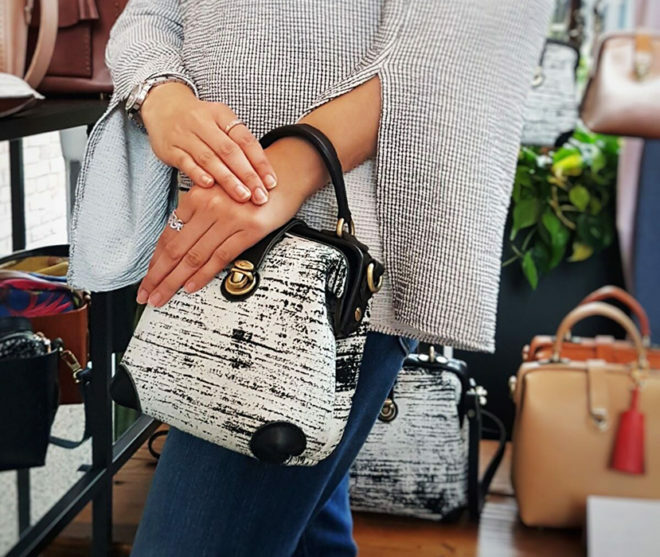 It’s great to see a variety of designer’s showcasing at the event and even more new ones to check out like Dee De Lara‘s repurposed jewelry and LAPERELL’s shell bag. Be sure to check out the Inland show September 29 – 30 in Toronto because everyone has something unique to share. Beautiful images and baubles, although I will say I am absolutely in love with some of those handbags. If I were a wealthy woman, that would be my splurge! Thank you! I’m saving up to buy one of the bags. It’s great that it’s not full-on luxury priced and the quality is amazing. Whenever I travel with my wife, I always push that we get some accessory from a local market. Beats the standard China-made souvenir and makes for something more interesting. Good finds! I love all the pictures you shared! The bags are so stylish, the earrings are beautiful and the necklaces are perfect for layering ! You’re absolutely right! Everything is wearable and beautiful. AH I’m obsessed with those Arc pieces. The nape length choker especially… so classy. I know! Everything Lina makes is so omfhy but still wearable! So my mom and sister love shoes, bags and jewelry but I am all about bags and earrings. I do like necklaces but have a tendency to play with them like a cat with a string. My wife and daughter would love the bags, I’ll definitely be sharing this post with them! I LOVE the Arc Jewellery line! I need to get me some pieces for some of my Indian outfits! Ah, yes! Indian outfits are already so dressed up that simple jewellery would look great to balance the look. I’m not really a jewelry person, more of a simple – a ring on my hand. But some of these products are pretty! Especially those handbags! Love shopping for handbags! Those bags looks so stunning and beautiful. I really like it. and the jewelries are so splendid. Yup, these were some of my favourites from the show. Awesome baubles! I love buying from locals especially if it is handmade! I wanted to be a jewelry designer so bad when I was in school but chose photography instead! This makes me so envious, beautiful jewelry and bags! Amazing stuff thanks for sharing.